This game is the crown jewel of my collection. It is considered rare. "Four against one is fair play when that one is the mighty Eliminator--a large spheroid that floats randomly about the video screen. This Eliminator is invulnerable except through a narrow passage (its throat?) to its core. During the game, the Eliminator sends out ships bent on destroying the up-to-four players (who can choose to work alone or in teams of two). You and your fellow players, while avoiding Eliminator ships, attempt to force opposing players' spaceships (with energy bolts that push objects) into a deadly collision with the Eliminator base. The lone surviving player must then fire down the Eliminator's throat to win the game." The description above is for the four player version of Eliminator. This version is a tabletop game where the players stand at each side of the table at controls for a ship, and all four players compete at once. 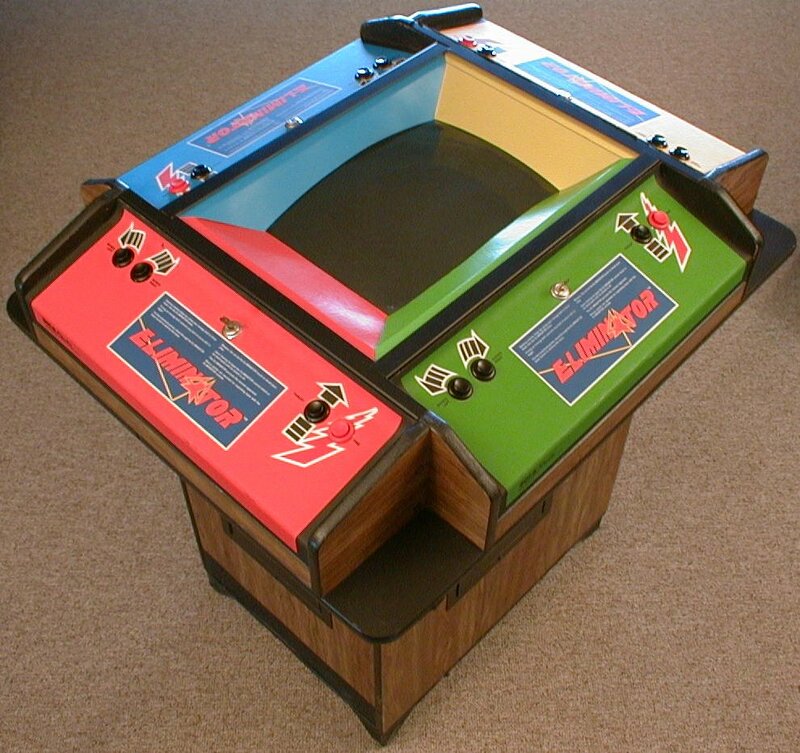 Eliminator also came in a more common upright two player version, and an equally rare cocktail. Eliminator was a game from of the line of Converta-System games introduced by Sega/Gremlin. The system was designed such that operators could easily convert from one game to another just by swapping game cages and artwork.